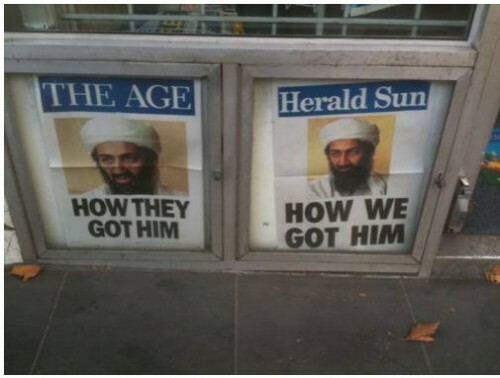 The ABC Drum gave its pathetic views on the death of Osama bin Laden, as did the Age in this photo by Andrew Bolt reader, Michael. It is a relief to get a reality check in the strongly worded but so much saner and realistic assessment of the admirable Christopher Hitchens. If you tell me that you are staying in a rather nice walled compound in Abbottabad, I can tell you in return that you are the honoured guest of a military establishment that annually consumes several billion dollars of US aid. The sheer blatancy of it catches the breath. The strange, scrofulous quasi-nobility and bogus spirituality of his appearance was appallingly telegenic, and it will be highly interesting to see whether this charisma survives the alternative definition of revolution that has lately transfigured the Muslim world. The most tenaciously lasting impression of all, however, is that of his sheer irrationality. Well, he and his fellow psychopaths did succeed in killing thousands in North America and western Europe, but in the past few years their main military triumphs have been against targets such as Afghan schoolgirls, Shi’ite Muslim civilians and defenceless synagogues in Tunisia and Turkey. Has there been a more contemptible leader from behind or a commander who authorised more blanket death sentences on bystanders? Thank you for this fitting obituary, Mr Hitchens. This entry was posted on May 3, 2011 at 20:06 and is filed under Uncategorized. You can follow any responses to this entry through the RSS 2.0 feed. Both comments and pings are currently closed.